I was really in the mood for some Greek cuisine last week and decided to change up they way I cooked my chicken. The end result was tender, easily shreddible, favorable chicken breasts with Greek flair. I actually made it two nights in a row I loved it so much! The first night we ate it as is with feta sprinkled on top. The feta softened up over the warm chicken and was rich in flavor. We served it with a side of Greek Salad and sliced Pita bread. The second night we made it for Greek Gyros and they tasted fabulous! This chicken is extremely tender, easy to make and full of delicious flavor! Line slow cooker with liner or cooking spray. Rub each chicken breast with Greek Rub to coat generously on each side. Next, rub about ½ Tablespoon of garlic on each chicken breast. Place chicken breast in slow cooker and drizzle lemon juice over the top. Crumble and stir 2 chicken bouillon cubes in 1½ cups of hot water. Once dissolved and stirred as best as possible. Pour over chicken. Cover with slow cooker lid. Cook on LOW for 6 hours, or until cooked through and tender. Here is a link for The Pampered Chef Greek Rub that I use. It is one of my favorite rubs ever! This amazing and sound so good! I have been craving greek food lately, so this is perfect! Looks wonderful! We love feta, as well. My hubs says "everything's betta' with feta'" haha!! Thanks for the share--I'm all about slow cooker! As a teacher, I get home late very often. Can't wait to try this one! Looks incredible!! I too can't get enough Feta cheese. Slow cooker meals always make so much food - at least for two people which is what my family is currently. Anyway, it is always great for leftovers, especially when you can twist it just a bit for something new! What would be the herbs to use if I don't have a greek rub? Now you have me totally craving Greek food at 11PM! I love Greek food too and I'd sit up tall at your table for this dish. Love your recipe. Thank you and have a wonderful Monday! I was also wondering what herbs to use if you don't have Greek rub. And is the pampered chef the only one to make it? Is there something else that is similar? This looks awesome! I love crock pots - the recipe looks especially easy too! Can't wait to try it! Pinned! I am wondering - wouldn't it be easier to add canned chicken broth or sock rather to dissolve bouillon cubes? I don't think socks would be good in it. Can you find greek rub in the grocery store if you don't have the Pampered Chef brand? I just made this recipe this am. Love the slow cooker recipes for those busy days. I found a Greek seasoning from McCormick at the store. (Marianos) by us. It is in the gourmet collection. Can't wait for dinner this evening. Yep! I have found several different Greek rubs/seasonings at the supermarket. This looks amazing and I love Greek dishes!! I am co-hosting Tasty Tuesdays this week and would love for you to link up this recipe. This sounds delicious and easy! Do you have a recipe for the side dish you show in the picture! I'm looking for healthy and easy dishes since I am a teacher. 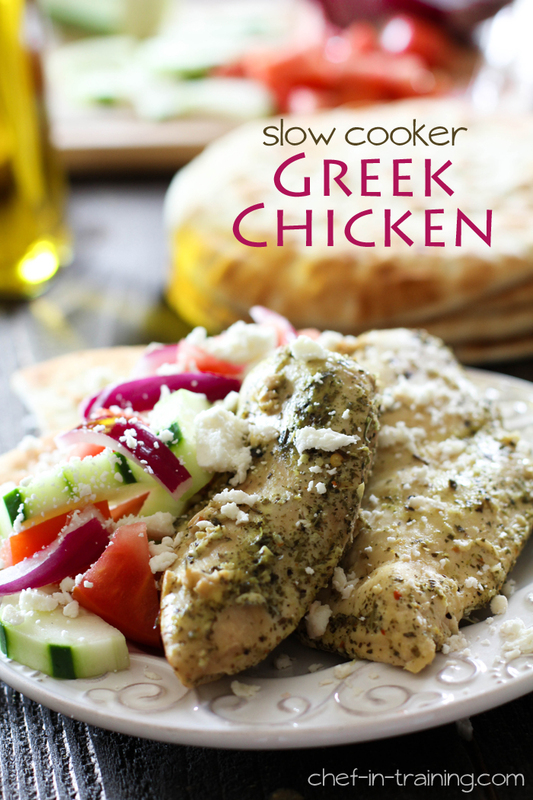 Slow cooked chicken always comes out so tender, and I love all Greek flavors. I bet splashing some Greek yogurt over this chicken would be pretty delicious too! What spices are in the Pampeted Chef Rub? Putting this in the crockpot for tonight's dinner! But I subbed the water and bouillon for chicken stock and I'm adding in some cut potatoes. Can't wait for dinner! This looks great. I am excited to try it this week. For those looking for an alternative to the greek rub. McCormick sells one for about $4 a bottle. I will also be using low sodium chicken broth in place of the bullion/water combo. If you use chicken broth instead, how much chicken broth should you use? I made this last night and we hod it with wraps. Just put the hot shredded cicken on the wrap and then sprinkled feta cheese on the chicken then added lettuce and tomato and some fresh ground pepper. It was fantastic! My son said it was. The. Best thing I ever made in the crockpot! Thanks for the great recipe. If anyone is wondering I used 1 and half cups chicken broth in place of the bullion cube and hot water. Will be making this a lot!!! This was so dry and bland! The chicken was ridiculously over cooked to the point of having that terrible grainy consistency. And like I said, inedibly bland! The chicken somehow ended up being tender and easy to cut through, but extremely dry. If it hadn't been so dry it would have been a good dish. :( I was hoping that for a "chef" in training you would tell us how to make a spice rub rather than point us in the direction of a prepackaged blend. I was interested in this recipe. However, I don't have the Pampered Chef brand Greek Rub. What is it made out of and what can we use instead? Looks great! And it's really easy to google "Greek spice rub"
The link to the pampered chef Greek rub is no longer valid.